Affordability looks like it will serve as the catalyst for a hot Cleveland real estate market for the foreseeable future. Cleveland real estate investors saw some of the highest returns on their investments in the third quarter of 2018. Real estate in Cleveland appreciated at nearly twice the rate of the national average in the last year. The Cleveland real estate market, while not at the forefront of the industry, deserves more attention than it is currently getting. Despite having appreciated at nearly twice the rate of the national average in the last year, demand remains intact. In fact, affordability looks like it will serve as the catalyst for a hot Cleveland housing market for the foreseeable future. The unique combination of affordability and demand has created the perfect environment for anyone looking to participate in the local housing sector, especially investors. The median home price in the Cleveland real estate market is currently resting at approximately $54,200, according to Zillow’s Home Value Index. While relatively low, today’s home prices are the beneficiaries of a strong year’s worth of appreciation. In the last 13 months (October 2017 to November 2018), home prices in the Cleveland area have increased 13.6%, most likely because of the city’s insufficient inventory of available homes. Despite modest increases in available inventory, the number of homes available to purchase are still low. It’s reasonable to suspect the lack of inventory to continue to drive up prices. In the next year alone, Zillow suggests real estate in Cleveland may rise an additional 7.0%. To put things into perspective, the national average saw home values increase at nearly half the rate (7.7%) of Cleveland real estate in the last year. What’s more, it looks as if Cleveland’s one-year forecast is expected to outpace the national average, albeit modestly. According to data presented by RealtyTrac, one of the nation’s premier real estate information companies and online marketplaces for foreclosed and defaulted properties, the Cleveland housing market is home to upwards of 5,008 foreclosures. Of the homes identified by RealtyTrac, 58% are pre-foreclosures, which means the homeowners aren’t officially in default, but instead are at risk of defaulting if they continue to miss payments. About one-quarter of Cleveland’s foreclosures (26.8%) are bank owned. As their names suggest, bank-owned homes have been repossessed by the original lenders. The remaining foreclosures (15.1%) are either up for auction, or are going to be sometime in the near future. 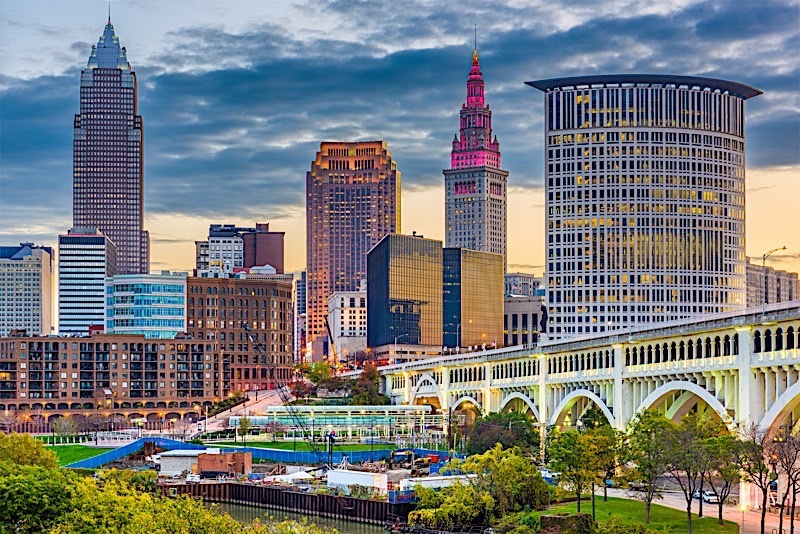 The Cleveland real estate market was the center of investor attention in the third quarter of 2018. The city’s unique combination of affordable homes and demand resulted in a hotbed of activity for just about everyone willing to participate in the market. Sellers saw their own assets increase in value at nearly twice the rate of the national average, buyers were still awarded the opportunity to purchase relatively affordable homes, and investors became the beneficiaries of incredibly attractive profit margins. In fact, third quarter indicators were so positive that real estate in Cleveland helped investors make some of the best returns on their investments in the entire country. Cleveland was one of the best places to flip properties in the second half of 2018. With median home values approximately one-fifth that of the price of the national average, the Cleveland real estate market is nothing if not affordable. That said, the low prices are nothing to be worried about. The rate of appreciation in Cleveland over the last year is incredibly encouraging, and it looks as if it will continue to outpace the rest of the country for the foreseeable future. What’s more, demand still remains in tact, creating the perfect environment to either buy, sell or invest in real estate. Have you thought about investing in the Cleveland real estate market? If so, what are you waiting for? We would love to know your thoughts on real estate in Cleveland in the comments below.